In this narrative history painting, Joseph Mallord William Turner expressed the power of nature and the heroism of man through the eyes of a Romantic painter. Turner used quick, slanting brushstrokes to describe the stormy sky. The application of scumbled white paint suggests churning, turbulent seas and the heavy spray of waves hitting the ship's bow. Tones of brown paint near the bottom of the canvas give a sense of the sea's violent power. On the foredeck of a ship that strains against the waves, a man stands in a white uniform and waves with confidence. While scholars are uncertain of the exact historical event Turner described, one probable interpretation is that the man depicted here is Dutch naval officer Cornelis Van Tromp, who was dismissed from naval service in 1666 after failing to follow orders. Van Tromp was reinstated in service and reconciled with his navy superiors in 1673. In perhaps a symbolic overture signaling his submission to authority, Tromp is shown, in Turner's words, "going about to please his Masters." possibly George Pennell, sold to Charles Birch, 1845. Thomas Agnew & Sons, Ltd. (London, England), sold to Henry Woods, 1867. Thomas Holloway, 1800 - 1883 (London, England), by bequest to Royal Holloway and Bedford New College, University of London, 1883. Royal Holloway and Bedford New College, University of London, sold to the J. Paul Getty Museum, 1993. "The Royal Academy. The Seventy-Sixth Exhibition." The Art-Union, no. 67, supplementary number (June 1, 1844), p. 158. The Exhibition of the Royal Academy. MDCCCXLIV. The Seventy-Sixth, exh. cat. (London: Royal Academy, 1844), p. 14, no. 253. "Fine Arts: Royal Academy." The Athenæum: Journal of English and Foreign Literature, Science, and the Fine Arts, no. 863 (May 11, 1844), p. 433. "Guide to the Exhibitions. The Royal Academy." The Critic, of Literature, Art, Science, and the Drama 1, no. 9 (May 15, 1844), p. 197. "The Exhibition of the Royal Academy." The Illustrated London News 4, no. 106 (May 11, 1844), p. 306. "Fine Arts. Royal Academy. [Seventy-sixth year]." The Literary Gazette and Journal of the Belles Lettres, Arts, Sciences, etc., no. 1425 (May 11, 1844), p. 306. "Fine Arts. Royal Academy Exhibition, 1844." The Spectator, no. 828 (May 11, 1844), p. 451. The Exhibition of the Liverpool Academy: The Twenty-Sixth (Liverpool: G. J. Keet, 1850), p. 8, no. 37. Twenty-Sixth Exhibition of the Royal Scottish Academy of Painting, Sculpture & Architecture, exh. cat. (Edinburgh: Schenck & McFarlane, 1852), p. 4, no. 21. Burnet, John, and Peter Cunningham. Turner and His Works (London: David Bogue, 1852), p. 120, no. 229. Catalogue of the Art Treasures of the United Kingdom, Collected at Manchester in 1857, exh. cat. (London: Bradbury and Evans, 1857), p. 90, no. 282 (as "Van Tromp"). Christie and Manson, London. Catalogue of the Valuable and Extensive Collection of English Pictures and Drawings, Formed with Great Judgment and Taste, by that Well-known Amateur, John Miller, Esq., of Liverpool. May 20-22, 1858, p. 30, no. 248. Thornbury, Walter. The Life of J. M. W. Turner, R. A. Rev. ed. (London: Chatto & Windus, 1897), pp. 92, 580, 606. Thornbury, Walter. The Life of J. M. W. Turner, R. A. 2 vols. (London: Hurst and Blackett, 1862), vol. 2, pp. 383, 405. Dafforne, James. The Works of J. M. W. Turner, R. A. (London: Virtue & Co., 1877), p. 113. Christie, Manson & Woods, London. Catalogue of Highly Important Modern Pictures. May 5, 1883, p. 25, lot 147. Carey, Charles W. Royal Holloway College, Egham: Catalogue of Pictures. 3rd. ed. (London: Simpkin, Marshall, Hamilton, Kent & Co.; Egham: Box & Gillham, 1896), p. 42, no. 43. Carey, Charles W. "The Royal Holloway College Collection. IV." The Art Journal 59 (November 1897), pp. 335-37, ill.
Carey, Charles W. "The 'Van Tromp' Pictures of J. M. W. Turner, R. A." The Magazine of Art 22 (1899), pp. 173-75, ill.
Wedmore, Frederick, ed. Turner & Ruskin: An Exposition of the Works of Turner from the Writings of Ruskin. 2 vols. (London: George Allen, 1900), vol. 1, ill. facing p. 132. Bell, Charles Francis. A List of the Works Contributed to Public Exhibitions by J. M. W. Turner, R. A. (London: George Bell and Sons, 1901), p. 150, no. 245. Armstrong, Sir Walter. Turner. 2 vols. (London: Thomas Agnew & Sons; New York: Charles Scribner's Sons, 1902), pp. 161, 231. Exhibition of British Art, c. 1000-1860, exh. cat. (London: Royal Academy of Arts, 1934), p. 72, no. 158. The First Hundred Years of the Royal Academy, 1769-1868: Winter Exhibition, 1951-52, exh. cat. (London: Royal Academy of Arts, 1951), pp. 73-74, no. 158. Cunningham, Charles Crehore. "Turner's Van Tromp Paintings." Art Quarterly 15, no. 4 (Winter 1952), pp. 323-30, fig. 3. Finberg, Alexander Joseph. The Life of J. M. W. Turner, R. A. 2nd. ed., rev. by Hilda F. Finberg (Oxford: Clarendon, 1961), pp. 400, 508, 516, nos. 559, 593. Rothenstein, John, and Martin Butlin. Turner (New York: George Braziller, 1964), pp. 58, 68, pl. 123. Butlin, Martin, et al., eds. Englische Malerei der Grossen Zeit: Von Hogarth bis Turner, exh. cat. (Cologne: Wallraf-Richartz Museum, 1966), unpaginated, no. 61, ill.
Carandente, Giovanni, ed. La pittura inglese da Hogarth a Turner (1730-1850), exh. cat. (Rome: Palazzo Venezia, 1966), unpaginated, no. 62, ill.
Agnew's 150th Anniversary Loan Exhibition of Paintings and Watercolours by J. M. W. Turner, R. A., exh. cat. (London: Thomas Agnew & Sons, 1967), pp. 47-48, no. 33. Butlin, Martin, et al., eds. Malarstwo Angielskie od Hogartha do Turnera, exh. cat. (Warsaw: Muzeum Narodowe, 1967), p. 42, no. 61, ill.
Bachrach, Fred G. H., ed. Schok der Herkenning. Het Engelse landschap der Romantiek en zijn Hollandse Inspiratie. Jubileum Tentoonstelling 50 jaar Genootschap Nederland-Engeland, exh. cat. (The Hague: Mauritshuis, 1970), unpaginated, no. 49, ill.
Bachrach, Fred G. H., ed. "Shock of Recognition": The Landscape of English Romanticism and the Dutch Seventeenth-Century School, exh. cat. (London: Arts Council of Great Britain, 1971), unpaginated, no. 47, ill.
Bock, Henning, and Ursula Prinz, eds. J. M. W. Turner: Der Maler des Lichts, exh. cat. (Berlin: Gebr. Mann Verlag, 1972), p. 116, no. 34. Bachrach, Alfred Gustave Herbert. Turner and Rotterdam, 1817-1825-1841 (n.p., 1974), p. 20. Gaunt, William. Marine Painting: An Historical Survey (New York: Viking, 1975), pp. 117, 121, fig. 105. Joll, Evelyn, ed. Turner: A Special Loan Exhibition of 20 Rarely Seen Paintings, exh. cat. (London: Tate Gallery, 1977), p. 22, ill.
Butlin, Martin, and Evelyn Joll. The Paintings of J. M. W. Turner. 2 vols. (New Haven and London: Yale University Press, 1977), vol. 1, pp. 233-34, no. 410; vol. 2, unpaginated, pl. 396. Wilton, Andrew. J. M. W. Turner: His Art and Life (New York: Rizzoli, 1979), pp. 216-18, 288, no. P410. Gage, John, ed. Collected Correspondence of J. M. W. Turner (Oxford: Clarendon, 1980), p. 196n7. Butler, Lionel, and Jeannie Chapel, eds. Thomas Holloway: The Benevolent Millionaire, exh. cat. (London: Thomas Agnew & Sons, 1981), pp. 60-61, no. 42, ill.
Joll, Evelyn. "Turner's Ostend." In A Dealer's Record: Agnew's 1967-81 (London: Barrie & Jenkins, 1981), pp. 149-51, fig. 40. Chapel, Jeannie. Victorian Taste: The Complete Catalogue of Paintings at the Royal Holloway College (London: A. Zwemmer, 1982), pp. 138-40, no. 76, pl. 26. Joll, Evelyn, and Martin Butlin. L'opera completa di Turner, 1830-1851 (Milan: Rizzoli, 1982), p. 215, no. 504, ill.
Bowness, Alan, et al., eds. J. M. W. Turner, exh. cat. (Paris: Éditions de la Réunion des musées nationaux, 1983), pp. 146-48, no. 75, ill., entry by Evelyn Joll. Butlin, Martin, and Evelyn Joll. The Paintings of J. M. W. Turner. Rev. ed. 2 vols. (New Haven and London: Yale University Press, 1984), vol. 1, pp. 257-58, no. 410; vol. 2, pl. 415. Chapel, Jeannie. "The Turner Collector: Joseph Gillot, 1799-1872." Turner Studies 6, no. 2 (Winter 1986), pp. 45-46, fig. 3. Chapel, Jeannie, and Charlotte Gere. The Art Collections of Great Britain and Ireland (New York: Harry N. Abrams, 1986), p. 164. Wilton, Andrew. Turner in His Time (New York: Harry N. Abrams, 1987), pp. 243, 245. Sammone, Maria Allison. 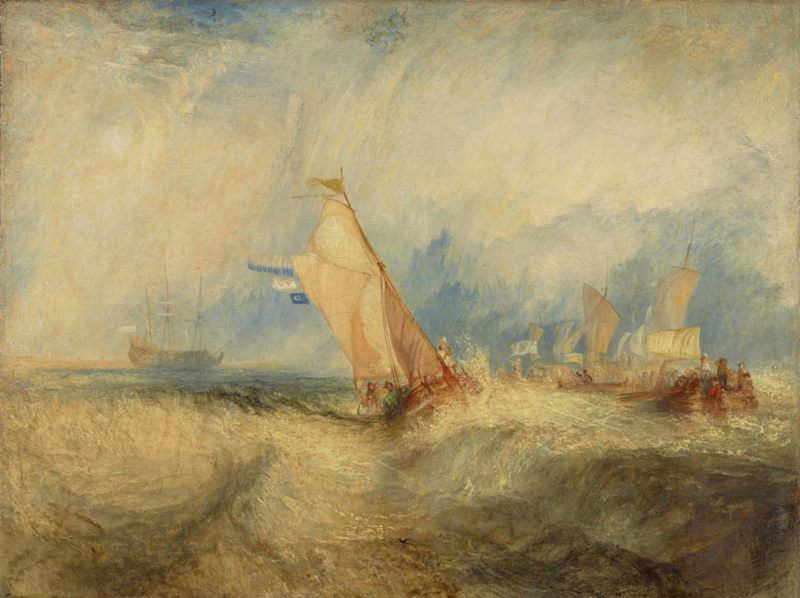 "A Question of Title: Turner's van Tromp Controversy and the Romantic Sublime." M.A. thesis (University of California, Santa Barbara, 1990), pp. 10-11, 13-15, 19-21, 25, ill.
Bachrach, Alfred Gustave Herbert, ed. Turner's Holland, exh. cat. (London: Tate Gallery, 1994), pp. 22-23, 53, no. 17, ill.
Fredericksen, Burton B., et al. Masterpieces of Painting in the J. Paul Getty Museum. 3rd ed. (Malibu: J. Paul Getty Museum, 1995), unpaginated, no. 47, ill., entry by Perrin Stein. Lloyd, Michael, ed. Turner, exh. cat. (Canberra: National Gallery of Australia, with Thames & Hudson, 1996), pp. 174-75, 231, no. 26, ill.
Jaffé, David. Summary Catalogue of European Paintings in the J. Paul Getty Museum (Los Angeles: J. Paul Getty Museum, 1997), p. 127, ill.
Fredericksen, Burton B., et al. Masterpieces of the J. Paul Getty Museum: Paintings (Los Angeles: J. Paul Getty Museum, 1997), pp. 118-19, no. 65, ill., entry by Perrin Stein. Walsh, John, and Deborah Gribbon. The J. Paul Getty Museum and Its Collections: A Museum for the New Century (Los Angeles: J. Paul Getty Museum, 1997), p. 128, ill. The J. Paul Getty Museum Handbook of the Collections. 6th ed. (Los Angeles: J. Paul Getty Museum, 2001), p. 143, ill.
Allen, Denise, et al. Masterpieces of Painting in the J. Paul Getty Museum. Rev. ed. (Los Angeles: J. Paul Getty Museum, with Thames & Hudson, 2003), pp. 116-17, no. 64, ill., entry by Perrin Stein. Hamilton, James, ed. Turner: The Late Seascapes, exh. cat. (Williamstown: Sterling and Francine Clark Art Institute, with Yale University Press, 2003), pp. 92, 93, 155, fig. 54. Wilton, Andrew. Turner in His Time. Rev. ed. (New York: Thames & Hudson, 2007), pp. 243, 245. The J. Paul Getty Museum Handbook of the Collections. 7th ed. (Los Angeles: J. Paul Getty Museum, 2007), p. 132, ill.
Brown, David Blayney, Amy Concannon, and Sam Smiles, eds. J. M. W. Turner: Painting Set Free, exh. cat. (Los Angeles: The J. Paul Getty Museum, 2014), pp. 164-65, no. 98, ill., entry by Sam Smiles. Lesson in which students discuss the historical narrative Van Tromp, Going About to Please His Masters by Turner and explore Romanticism's influence.